The Radical Republicans, tearing up the legislature. The Radical Republicans were an abolitionist faction of the Republican Party from the mid 1850s to the end of Reconstruction. They were vehemently opposed to slavery, believed in a strong central government, and supported the X-Games, burger shacks, shredding, and all things totally tubular. In the senate, their leader was Thaddeus "Da Bomb Diggity" Stevens. In the House of Representatives, Charles "Wicked Bitchin'" Sumner lead the faction. Abraham Lincoln's status as a radical republican is actually somewhat debatable. Lincoln privately expressed strong anti-slavery feelings and could bust out a diesel acid soul, but he publicly was often harshly criticized by other radicals for being too slow to end slavery, and never even trying to go bio on his 540s. Still, Lincoln appointed many radicals to high cabinet positions, most notably Edward "Big Time" Stanton, Lincoln's secretary of Being Totally Gnarly, and also War. While most know of the disputes over slavery that drove apart North and South, few acknowledge the way more bodacious conflicts of the era. Perhaps the most divisive battle was over the nation's boardwalks. The Southerners, fearing being run into by skaters of both the inline and board varieties during their boardwalking, outlawed moving while on top of wheels on all boardwalks, in the North as well as the South. Radical republicans were outraged. "This is, like, way not cool," said Salmon Chase in one of his speeches to Congress. "We're like, into boarding or inline and we wanna do that, you know, wherever." 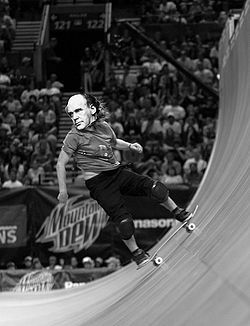 Salmon P. Chase, shredding on the Congressional halfpipe. The South's resolve was strong, on that and other issues as well. "We sincerely want nothing more than to be safe, which we hope to accomplish by banning skateboarding, load music, driving above 30 miles per hour, and remaining in a mall or similar commercial area for longer than 45 minutes. It's definitely not that we hate fun at all or anything like that, you stupid kids," said the response from Stephen A. Douglas. "And stay off my lawn!" he added. Unable to resolve the rising tensions, the Southerners began to contemplate secession. "Just think," speculated Jefferson Davis. "No more skate parks. No more loud music. No more fast food restaurants. No more radicals! And also the keeping slavery is nice. But can we talk about the skate parks? Man I hate those!" And in this way, the South spiraled toward secession, until, on Christmas Eve of 1860, the spiraling stopped, and the seceding began. "Woah. Not cool, brah." This was the outcry of the North as South Carolina, and then the rest of the South seceded from the union. Radicals were quick to denounce this display as "totally lame," and suggesting to the seceding southerners, "bag your face, narbos!" The South was quick to retort, suggesting that the radicals, and Northerners in general, were "nothing but a bunch of slackers, and you'll always be slackers, just like your fathers!" As the northern and southern armies fought some of the bloodiest battles that the world had ever seen, their leaders began facing off as the battle of words rapidly grew into other forms of conflict. Though the North suffered an early defeat in the Battle of the Bands to Stonewall Jackson's thrash metal group, Thaddeus Stevens's narrow victory over Joe Johnston and PGT Beauregard at the inline skating invitational tournament set the stage for the last major conflict between the North and the South: April Fool's Day, 1865. The South, their resources stretched to breaking point by the long days of trading insults, was unprepared. The North, meanwhile, had been winning the majority of arguments over which side was less illin', and had a high morale. This enabled its leaders to prepare for a massive pranking, beginning just after midnight, early in the first morning of April. The Southern troops awoke that day to saran wrapped toilets, stapled underwear, and shaving cream covered faces. They were so busy avoiding fake dog poop, scratching at their itching powder'd behinds, and looking for the actually nonexistent third of the "four" pigs released by northern troops that they were completely unprepared by the swarms of northern soldiers that charged in and began to melvin and tabletop them. The South, its morale utterly crippled and its attractive girlfriend won over by the North, surrendered 8 days later. Also there was probably some warfare or something, but that was probably not as important as the whole pranking thing. Lt. Governor of New York, founder of the Times, extreme sports celebrity: Henry Jarvis Raymond had it all. 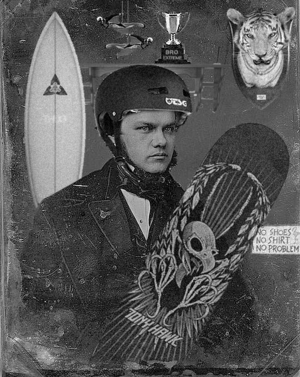 Unfortunately, disagreements with other, even more radical republicans over halfpipe angles and rail placement led Raymond to retire from politics shortly after the Civil War. During Reconstruction, the Northern radicals sought to remake the South. They were at first highly successful. Radicals took over the Congress, and were able to pass all the legislation they wanted to, even though Andrew Johnson was, like, a major dork. Three important amendments, the 13th, 14th, and 15th, which gave all people, regardless of race, time, or location, the right to skateboard and rollerblade, surf and snowboard, and BMX bike, respectively. Also they freed the slaves and equal rights and black suffrage and stuff. But mostly the X-Games. Unfortunately, the Republicans were not in control long enough to ensure black equal treatment in the defiantly bigoted South, or to ensure the liberty to use razor scooters in the half pipes of skate parks. 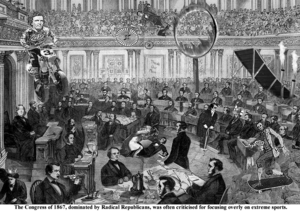 By 1874, the radicals had lost control of Congress, and Reconstruction ended. In the South, many cranky old dudes resented the radicals' use of slang words they didn't understand, and insistence on playing loud music past 8 o'clock. These resenting feelings gave way to resentful actions, and a resenting air of resentment permeated the resentment. Despite white people's seething hatred of all things tubular, black people, who are widely known to have a genetic predisposition for being cooler, celebrated the radicals' reforms. They could now skateboard, surf, and bike, as well as do some other stuff like vote and not be slaves. These were huge increases in their freedoms, and the radicals' reforms eventually gave way to future civil rights movements, especially the one with the dream. The radicals themselves, though, just sort of faded out of the spotlight. Some of them got radical jobs, like skate shop owners, while others, like Salmon Chase, worked in more mundane places with a radical twist. Chase worked for the FBI's bank robbery unit, and helped to solve an important case by using his surfing ability. His brilliant crime-solving ability is memorialized in the classic film Point Break. Keanu Reeves, though he was described as "slightly less articulate" than Chase, "actually looks rather like him," according to director/historiographer Alan Smithee. Thaddeus Stevens, on the other hand, never worked again, living off gift baskets from freed slaves, and spending all his time surfing, until the end of his days.